Every pirate uses the same four digits to access Automated Gold Dispensers. It's called the "Pirate's Code". The play sound is missing the cannon effect and "I'm in charge nowwww"
It's amazing that thanks to Patches the Pirate, this card is finally good. Indeed. This card seems decent after STB nerf. With how many 1 drop 1/3's are running around, I wonder if this could work at those stats with how situational the effect is. 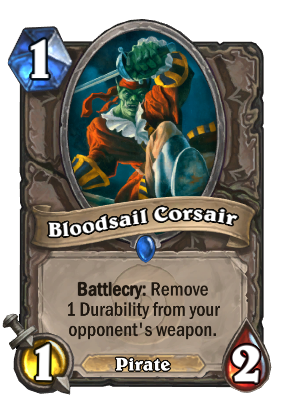 Or they could rework it into something that pirate decks would like more, like "Give your weapon +1 attack." As-is the only reason I can see anyone using this is if they really wanted another low-cost pirate, since pirate synergies tend to work best at lower costs. 1 mana 1/2 stats is absolutely unacceptable. The pirate tag is meaningless as there still isn't support for a Pirate themed deck yet, and the effect is not that effective even when it works. Now look at Acidic Swamp Ooze. 2 mana 3/2 stats is good enough on its own. When the effect works, the value is just insane, and the card will almost always consume 2 cards of the opponent. Sorry for replying to such an old comment, but why is a 1 2 for 1 worse that a 2 1 for 1? If only he knew now. This would actually be kinda good in a Hobgoblin deck. 3/4 that destroy's enemy weapon most of the time. Imagine u get this dude on arena and your opponent warrior just used gorehowl.